One cannot walk through the doors of the Milwaukee Art Museum without taking in a colorful burst of Dale Chihuly’s glass artwork. The Museum’s Isola di San Giacomo in Palude Chandelier II (at left) is one of the most popular works in the Museum, located at the entry of the Quadracci Pavilion. Milwaukee’s Suzy B. Ettinger, who was recently featured in a great Milwaukee Journal Sentinel Style article, donated the artwork in 2001 to brighten the Museum’s new white Santiago Calatava-designed addition. Museum visitors have been posing for photos with it ever since (it even appears snaking behind my own mother in her Facebook profile picture). Chihuly’s universal popularity encourages many museums to place his glass artwork front and center as a cheerful greeting. In fact, in the almost 50 years since he lived and studied in Wisconsin, no other artist can claim to have brought as much popular attention to American art glass as Dale Chihuly. This weekend, Wisconsin is celebrating Chihuly’s achievements. Dale Chihuly and the studio glass movement have a long history in Wisconsin. The University of Wisconsin-Madison will honor this tradition in 2013 by awarding Chihuly an honorary degree. The Doctorate of Fine Arts will be bestowed on the artist at the spring commencement ceremony on May 17 at the Kohl Center, which includes the colorful “Mendota Wall” of Chihuly glass. A native of Washington state, Dale Chihuly came to the University of Wisconsin in 1965 to study in the nation’s innovative first collegiate program in glass, which had been founded in 1963 by artist Harvey Littleton. Littleton and Dominick Labino (a glass research scientist at the Johns-Manville plant near Toledo, Ohio) are credited with founding the “American Studio Glass Movement.” The men ran two 1962 glassblowing workshops at The Toledo Museum of Art, during which they aimed to bring glass work out of large production factories to become a creative material for contemporary art. Littleton and Labino developed a small furnace, which allowed individual artists to engage with hot glass techniques, such as glass-blowing, mold-blowing, and glass sculpting. Such techniques had previously required factory facilities and teamwork, so they had been out of reach for individuals. Taking these innovations back to Wisconsin in 1963, Littleton introduced the first university program for glass in the United States. Dale Chihuly arrived to study there in 1965. A good way to sum up what was so different and special about this moment is that Littleton’s academic approach to glass changed artists’ focus from vessels or decoration to a primary concern with the execution of artistic ideas. Littleton’s students, who included Chihuly, Marvin Lipofsky, and Fritz Dreisbach, subverted the traditional associations between glass and functionality by creatively exploring sculptural forms. This online essay by the Corning Museum of Art explains their intentions in more depth. Littleton’s glass program was immediately popular. Art students immediately took to the medium, and the school produced many acclaimed glass artists as a result, further spreading its influence as years went on. An astute teacher, Littleton encouraged his graduating students to find academic employment and start more glass programs. Dale Chihuly was one of the students who took Littleton’s teachings to heart. After graduating, he pushed forward the “glass as art” idea by founding educational programs himself, and by developing a signature style so popular that his work adorns both museums and casinos. After graduating with a master of science degree from the University of Wisconsin-Madison, he had his first public exhibition at the Madison Art Center in 1967. Then, he moved east to study at the Rhode Island School of Design, where he later established the glass program at that august arts institution. 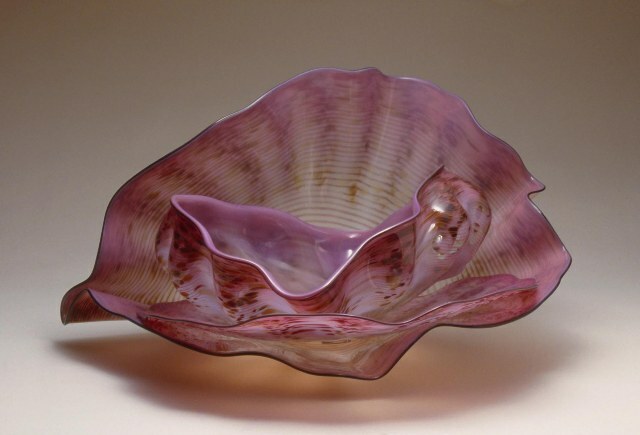 Dale Chihuly, Lavender Pink Macchia Set with Black Lip Wraps, 1986. Blown glass; 14 x 24 x 24 in. Milwaukee Art Museum, Gift of the Sheldon M. Barnett Family, Marilyn and Orren Bradley, Janey and Doug MacNeil, Audrey and Robert Mann, and Jill and Frank Pelisek. Photo by Dedra Wells. (c) 2013, Dale Chihuly. In 1968, Chihuly was awarded a Fulbright Fellowship to work at the Venini glass factory in Venice, Italy. There he observed the team approach to blowing glass, rather than the individual method he learned in Wisconsin with Littleton. In 1971, Chihuly co-founded Washington’s Pilchuck Glass School, now an international glass center and leader of the avant-garde in the development of glass as a fine art. 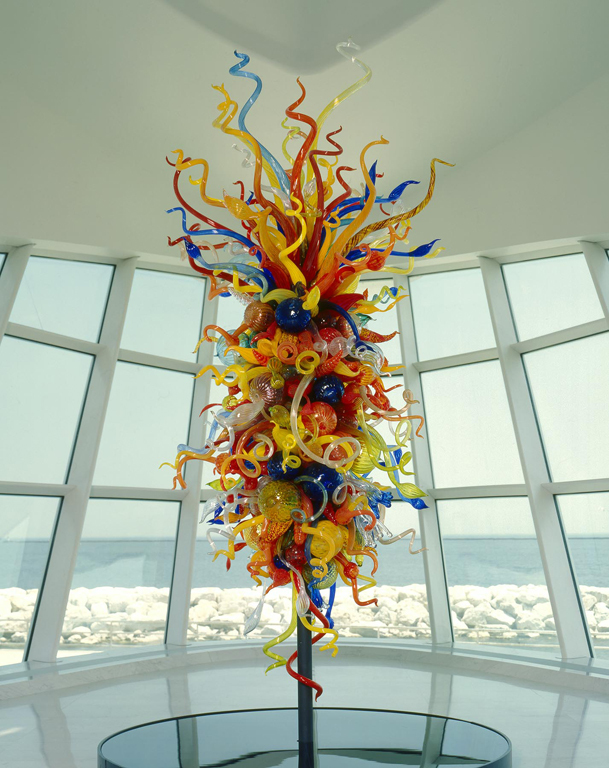 Chihuly’s work is included in more than 200 hundred museum collections worldwide, including, of course, the Milwaukee Art Museum. Chihuly has been the recipient of many awards, including eleven honorary doctorates and two fellowships from the National Endowment for the Arts. If you’d like to learn more about the artist as his work changes and his influence grows, the Chihuly Studio keeps an active online presence through a website, Facebook page, and Twitter account. We in Wisconsin are proud of our state’s contribution to the international field of glass as art. As the University of Wisconsin grants Dale Chihuly an honorary degree on May 17, 2013, they honor not only one of the school’s most well-known artists, but they pay tribute to a influential art movement that had its roots in our fine academic institutions and our thriving arts community. 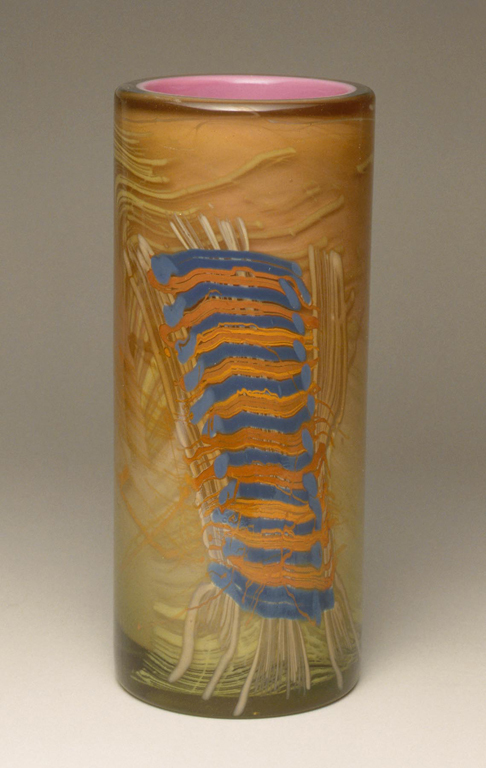 This entry was posted in Art, Curatorial and tagged Dale Chihuly, glass, wisconsin. Bookmark the permalink. Hi Mel, I thought you might like to see some of the work of the other person who helped form Pilchuck. I will be displaying his work at Gallery Night this Friday the 17th! If you’re looking for something different to do this Friday evening Mike Zimmer is hosting a Gallery Night at Translator, see the website and article for more information.